1. Walking around without too much direction during the day can lead to some amazing discoveries; little food markets, hidden art galleries, and amazing pieces of architecture are literally around the corner everywhere. 2. Get some foods from the market and talk to the vendors. The food is fresh, delicious, and has a great local quality. Great deals abound, especially with produce. Also, the stand-keepers are incredibly friendly and knowledgable about their products. A meat vendor who sold me some sausages told me how best to cook them, and an extremely enthusiastic Italian cheesemaker gave me samples of his various cheeses before I chose the cheese pictured below. 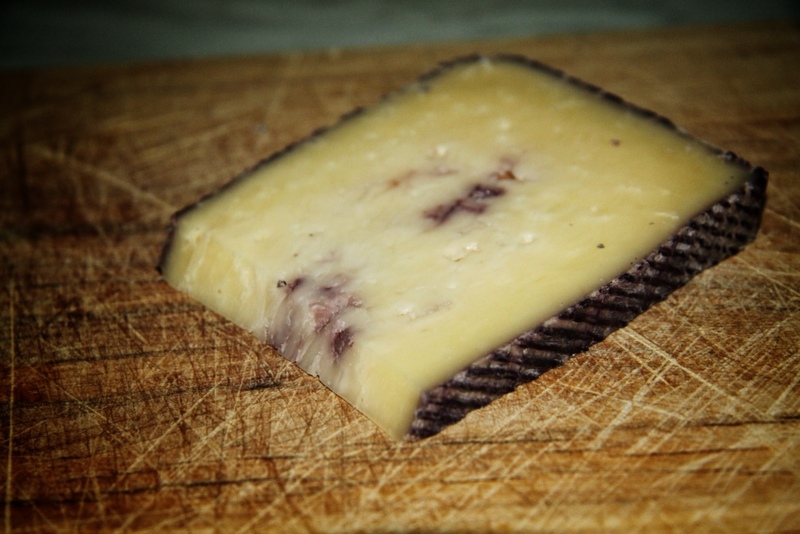 It's a cheese infused with wine, giving it an initial nutty, sweet flavor that fades into a mild creamy taste. It's among the tastiest (yet simplest) things I've ever eaten in my entire life, yet I only found it because I decided to walk the market route on a whim. 3. People love to have a little chat, and it makes the tube ride go more quickly. Londoners are quite generally friendly, and everyone we've talked with on our tube rides or in the pubs has been delighted to carry on a short conversation between the stations. Any topic will do, but the Olympics seems to be a great one, especially if you compliment the success of it. They are so very proud of their city, and rightfully so. Everything seems well organized and there is a festive spirit in the city. A well-dressed businessman whom we asked directions from was positively bouncing as he spoke about what fun it was to have the Olympics here. A side-note on conversations that we noticed quite early: your name and other personal information are rarely, if ever brought up in a conversation. The conversation begins, and names are exchanged later if the conversation is going incredibly well, but the casual tube talks don't ever last that long. 4. Speaking of Americans… Americans are loud. Really, really loud. Now that we have started to acclimate to this environment, we tend to blend in much more, talking quietly and not raising much noise. The Americans who are tourists, passing through for a matter of days, tend to stick out quite dramatically due to their volume. It's not a judgment either way, but just something that I wouldn't have noticed had I not been living here. 5. Adventure is out there! We have already engaged in so many spur-of-the-moment decisions, and they have led to great food, great experiences, and great stories. In London, if you don't act, you may not get the opportunity again. 6. Efficient public transportation is absolutely incredible. I bought an weekly travel card (unlimited use of the tube and buses) this week to last me until I can apply for a student one, and the sheer freedom it gives is incredible. I can get all around the city so quickly and easily. After a little over a week, I feel totally comfortable and confident reading the tube and bus route maps, transferring stations, and switching lines. I was surprised at how quickly it became almost unconsciously easy. More lessons to come as I learn and adventure! Thanks for the kind comment! We are having such a wonderful time and it’s so great to hear from a fellow Grinnellian! Deep and insightful observations! Glad you are adventuring and making the most of your GIL experience! !